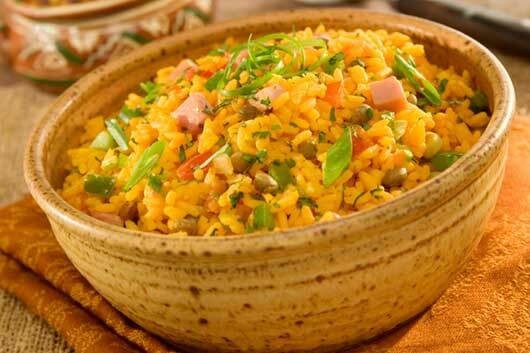 Pigeon Peas and rice is Puerto Rico’s national dish and no special occasion meal would be complete without Arroz con Gandules. This recipe from ViveMejor.com is a rice and pea dish seasoned with green olives and chopped ham. It makes a great side and even a light meal that the kids will love on it’s own. 1. Heat oil in large saucepan over medium-high heat and cook ham, stirring until browned. 2. Stir in onion and cook until softened. Add pepper and garlic and cook, stirring until softened. 3. Crumble Knorr ® Tomato Bouillon with Chicken Flavor Cubes into saucepan and stir to combine. Stir in rice, pigeon peas and bay leaf. Add water and bring to a boil over medium-high heat. 4. Reduce heat to low and simmer covered until all the liquid has been absorbed, about 20 minutes. 5. Stir in olives; remove from heat and let stand 10 minutes. Discard bay leaf. Photo & recipe courtesy Vivemejor.com.